Ultra-met has entered into a long term agreement with CY Carbide, Mfg. 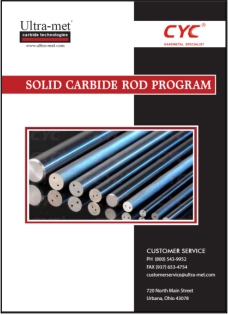 Co., Ltd. to be the exclusive distributor of solid carbide rods to North America. CY CARBIDE MFG. CO., LTD. was founded in 2002, is a professional manufacturer and exporter of high quality tungsten carbide products for metalworking, woodworking, mining, construction and tooling.